I’m very near completing Madison’s tall dresser, at this point the only thing complicated I have left to complete is the construction of the eight drawer boxes. Originally I intended to build them entirely from solid wood (and the plans for the project reflect this choice) but at the last minute I’ve decided instead to use a high quality Baltic Birch plywood. Plywood only requires that I cut the components to their final dimensions versus potentially resawing the thinner thickness from a thicker board, followed by jointing and planning it to size. For the amount of time they’re going to be viewed I’m not worried if anyone notices they’re not solid wood. I’ve come to the conclusion over the years that while solid wood drawer components give me a sense of continuity, in that all the parts in the construction are solid wood and not “engineered” materials, sometimes the amount of time and effort I have to invest in creating them can be better spent elsewhere in the project. Of course there are some limitations to what I can do with plywood when it comes to joinery, actually that’s not true, you can do almost exactly the same things it’s just that you may have to approach them differently. For example, I probably wouldn’t handcut dovetails for a drawer made with plywood sides, but it’s possible to machine cut them if you took steps to minimize any tearout on the face veneer. I will admit that probably the number one advantage of solid wood over plywood might be the fact I don’t have to worry about crappy/thin veneer faces, or the part becoming delaminated over time due to bad manufacturing but other than that I can’t think of anything more that would convince me it’s overtly superior. 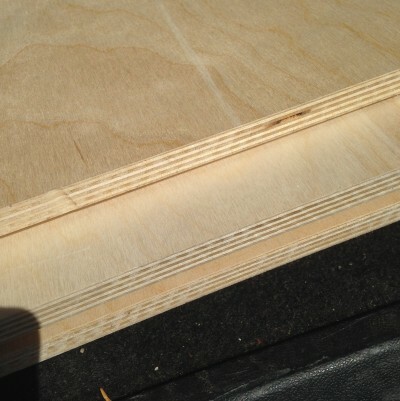 Of course if you’ve had a bad experience with plywood for these reasons then it’s probable you might not have worked with a good quality plywood yet. I’m the first to admit there’s some sticker shock when you see the price for a full sheet of a high quality plywood. But once you’ve experienced the results you get when you cut it to dimension and install it into place, you’ll immediately realize why it’s well worth paying a lot more for something that works as well as it does! What’s your worst plywood experience? Was it the face veneers just falling off? Delamination? Large patches or voids? Share them in the comments below. I feel plywood for drawer boxes is actually a responsible thing to do, environmentally speaking. Why waste solid wood when a sustainable product will function just as well? Part of using solid wood is so people can enjoy it, hard to do when hidden in another box. My worse experience was when I used it to make a shelf panel in a night stand. I edge banded with 3/4 by 1-1/2″ oak, while sanding the mating surfaces, well you can guess the rest. I was able to enact a repair by making a veneer the length of the shelf and about 4 inches wide to feather in. It didn’t work that well but passes. My wife saw the back edge and to this day thinks its a crack from caring it up the stairs! Ouch! But I’ve done a repair like that more than once. Usually I agree with you brother, not this time. As much work as you put into a piece for a family member and one that will probably be around for quite a while, I can justify the extra work and expense. Plywood everything is too much like kit furniture. Nothing wrong with solid wood components on the entire project, it still comes out looking beautiful. We can agree to disagree on this topic, all that matters is that we enjoy the process and others enjoy our results. Have you run in to any issues of the plywood bowing once you cut it to drawer dimensions? I recently tried using some 1/2″ plywood for drawer boxes and as soon as I started cutting the pieces from it they would bow quite a bit. Is this possibly just a symptom from using low grade plywood vs the normal behavior? I can’t say that I’ve ever had a significant bow occur when I cut a piece of plywood. I have no doubt it’s very possible though, and while my first assumption is that it is a result of the manufacturing process I can’t completely discount the shop environment. For example, plywood that’s moved from one extreme to another can become distorted rather easily if it’s not stored properly (in some situations practically kept in a large press to keep it flat) but I imagine in the scenario you described it was already showing signs of bowing? If I do have concerns a piece will distort on me and I’m pressed to use the piece, I’ll usually start considering what options I might have to help reinforce it. Things such as glue blocks, and other mechanical/design fasteners, etc. My worst experience was, the project was done just doing a light sanding and sanded through the veneer on the top most visible panel. Not so light sanding after all. UGH!!! I’ve done that so many times in the past, it’s like a kick to the gut. Sticker shock indeed! For most of my “pre-informed” days, i’d buy plywood from the big box stores. First time I bought good plywood from somewhere else, I purchased four sheets of it (I normally only need one at a time) and watched my wallet run faster than I can. I can appreciate that outraged feeling. I’ve felt that way when I have scraps leftover and then end up using them for something a far more inexpensive piece could have handled instead…as in some jigs or hidden components. My issues with plywood or other manufactured wood products, such as MDF or MDO, are the potential for off-gassing (e.g. FEMA trailers) and the increased respiratory risk from their dust. However, those risks are probably minimal with high-quality materials. Look for CARB II compliant (California Air Research Board) They have specific formaldehyde off gassing tests that need to be performed for sale in that very special state. Oddly enough I got mine from my local Menards. Home center birch plywood? I swear I once had a piece start to delaminate when they ripped it in the store for me…then they offered to help carry it to my car. I’m pretty sure I suggested they just keep cutting it into handi panels and sell it to someone else. I usually use ply for drawer bottoms and carcass backs. Oh – and shop furniture. For some shop items I’ll use it for the whole thing. The biggest issue I recall with ply was when I was building a rolling cart with drawers for under my TS extension wing. I came across a length of string/twine between layers. Somehow it got exposed from a cut, and I was able to pull it and “peel open” the plywood. Most of the sheets were OK (a little ‘chippy’ when cutting, but overall OK) and the cart to this day still looks great. For home center ply, it had great surfaces, stayed pretty flat, and very few to no voids (I think I had to re-cut one part due to a void, but that was it). I’m curious to know the story behind the string and why it was left in the middle of the layers of veneers in the first place? Thats not the oddest thing ever. Ive found, amongst other things, a sharpie marker, 1/4-20 bolt.. nails…. I use 1/2″ maple euro-ply that comes in 4’x8′ sheets for drawer construction. There are no footballs in the plywood or voids. Occasionally there are veneer de-lamination issues but rare. Originally, I would dovetail europly with router and jig ( a long process) but now I switched to the Festool Domino and 4x20mm dominos. For the 20mm dominos you have to set the depth of mortise to 20mm using the 4mm domino bit. I pin the Domino off the top & bottom edge of the parts and if I am making deeper drawers I mark a domino location in the middle. I glue up the domino locations and spread a light bead of Elmer’s along the outside edge of each corner of the drawer to keep the glue from seeping into the inside corners. Using dominos makes for a strong drawer. Just make sure your front & back parts are trapped in between the sides. Euro-ply has 9 layers and is very stable, therefore, no checking or shrinking. I must say I work in a small cabinet shop where we need to make cabinets efficiently but with quality. So, plywood drawers are the norm. Sometimes we make furniture and we will employ solid wood drawer construction with dovetails. By using euro-ply and dominos I have not had a drawer failure yet.